A carbon monoxide detector is an electronic device that senses the presence of carbon monoxide (CO) in a building and sounds an alarm to warn the occupants to escape. Carbon monoxide is an odorless, poisonous gas, which can be generated by gas furnaces and water heaters, ranges, space heaters, or wood stoves if they are malfunctioning or not vented properly. Cars, portable generators, and gas-powered gardening equipment also generate carbon monoxide and can cause problems if they are operated in enclosed areas or attached garages. Once inhaled, carbon monoxide inhibits the blood's ability to carry oxygen by replacing oxygen in the red blood cells, preventing the oxygen supply from reaching the organs in the body. This oxygen deprivation can cause varying amounts of damage depending on the level of exposure. Low level exposure can cause flu-like symptoms including shortness of breath, mild headaches, fatigue, and nausea. Higher level exposure may cause dizziness, mental confusion, severe headaches, nausea, and fainting. Prolonged high level exposure can cause death. According to the U.S. Consumer Product Safety Commission, more than 2,500 people will die and 100,000 will be seriously injured by carbon monoxide over the next 10 years. Technology used to detect carbon monoxide was originally developed for industrial applications. For example, the chemical industry uses a number of electronic gas sensors for analytical applications. Early industrial sensors involved a dual chambered sensor, which oxidized carbon monoxide and compared the heat of oxidation from the test chamber to a reference chamber. This type of oxidation requires a special platinum oxide catalyst and a heat source to burn the carbon monoxide. These systems were unacceptable for home use due to their complexity of operation, expense, and lack of sensitivity. However, in the last decade or so, home carbon monoxide detectors have become possible through improvements in advanced gas sensing technology. Other key factors have also contributed to the increased popularity of CO detectors. One is the rise in the use of other home safety appliances, such as smoke alarms. Another is the increased awareness of the dangers of carbon monoxide. Today, relatively inexpensive CO detectors can be purchased for as little as $30-$80. In fact, many cities are now requiring that at least one smoke detector be installed in every home, apartment, and hotel. The most important design factor for a CO detector is the type of sensor it employs. Home detectors may be designed with several different types of sensors. The simplest type is known as a detection card. These are fiberboard cards printed with a dot that chemically changes color when exposed to carbon monoxide. This type of detector does not sound an alarm and requires regular checks to determine if it has been exposed to carbon monoxide. While they are inexpensive ($4-$ 18), they do not offer sufficient protection to be used as a primary detector. The bio-mimetic gel sensor is a more sophisticated technology, which is designed to mimic the body's response to carbon monoxide by continually absorbing gas. However, because this type of sensor constantly absorbs carbon monoxide, it cannot reset itself to zero properly and is therefore more prone to false alarms. Furthermore, the bio-mimetic gel sensor can take up to 48 hours to reset after exposure during which time the occupants of the home are unprotected. Metal oxide sensors are more accurate and are the common type of sensor employed in home models. This type of sensor uses solid state tin-dioxide circuits, which clear quickly and continually monitor the air for presence of carbon monoxide. Detectors built with this technology can display CO concentration as a digital readout. When a specific CO level is reached, the detector sounds an alarm. However, these detectors have limited self-diagnostic capability to determine the efficiency or working condition of the sensor. Furthermore, they may be sensitive to gases other than carbon monoxide that are found in the home such as hair spray propellants. Finally, the accuracy of this type of sensor can drift by up to 40% after six months of use. Another type of sensor employed by certain manufacturers is the Instant Detection and Response (IDR) electrochemical sensing technology, which is claime to be the most effective detection method. IDR technology is used as an industry standard for professional sensing equipment and will instantly detect the presence of carbon monoxide. Detectors built with this technology will not react to other gases and are accurate to within plus or minus 3%. Another important design factor is the type of power source for the detector. Both battery powered and AC powered detectors are available. Battery operated detectors are easy to install, easy to move, and continue to operate during power outages when emergency heating systems might be in use. However, batteries must be replaced at least every two years. On the other hand, AC powered plug-in detectors do not require battery replacement. These electrically powered units are able to clear a false reading within minutes. Plug-in detectors with battery back up are also available at a slightly higher cost. In addition to battery and plug in models, some models are available which can be hardwired in place. This style allows multiple detectors to be wired together so that they all sound an alarm when carbon monoxide is detected by any of one of the detectors. 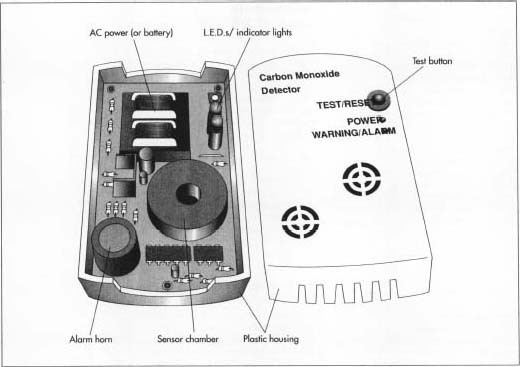 Carbon monoxide detectors are assembled from the following components: a sensor, which is capable of measuring the concentration of the gas and sending a signal when the carbon monoxide concentration reaches predetermined levels; a microprocessor, which is able to receive electrical signals from the sensor and able to send signals to the alarm horn and the control panel; a visual display (usually a Liquid Crystal Display (LCD) panel), which communicates CO level and other operating information; an alarm circuit capable of generating a sound loud enough to wake people sleeping in areas adjacent to the detector; a power connection (either an AC plug, battery connection, or both); a circuit board, which serves as a base for the electronic components; and a plastic housing which holds all the components together. The production of a carbon monoxide detector involves three major steps. The first step is the fabrication of the individual electronic components and attachment of these components onto the circuit board. The second is the fabrication of the plastic housing. The third step involves the assembly of all the components, testing to confirm performance, and packaging for shipment. 1 The circuit board is assembled from schematic plans by plating (or adding) copper onto the surface of the substrate in the desired pattern. The various diodes and circuit components are inserted into holes in the board and soldered into place. The major detector components such as the sensor chamber, alarm horn, and LCD display panel are usually manufactured separately by companies specializing in electronic componentry. These are often purchased by the smoke detector manufacturer. under pressure. After the plastic has cooled, the mold is opened and the plastic housing is ejected. The pieces may require manual brushing to smooth small imperfections or burrs in the plastic. 3 The circuit board is installed in the housing and appropriate connections are made. A test button is installed, a mounting bracket is added, and a cover is put in place to complete the assembly. The appropriate identification and warning labels are applied with pressure sensitive adhesive. A representative number of units are performance tested prior to packaging. Finally, the units are boxed and shipped to distributors. The key quality control feature of CO detector manufacture is the calibration of the sensor. The higher quality CO detectors are really gas monitors, which continually assess local concentration of CO compared to an internal standard. This calibration process allows the sensors to discriminate between a normal background level of CO and a dangerously high concentration. Under normal conditions, an acceptable background level may be as high as 25-35 parts per million (ppm). Harmful exposure can result if the concentration reaches the 75-100 ppm range. The Underwriter Laboratory standards for CO detectors requires them to sound an alarm within 90 minutes of exposure to 100 ppm CO; within 35 minutes when exposed to 200 ppm; and within 15 minutes when exposed to 400 ppm. Early CO detectors had to be manually calibrated by placing the instrument in an environment of known CO concentration and measuring the results. However, this process was expensive and time consuming and was therefore only used for expensive industrial equipment. With the increasing popularity of home units, more efficient calibration methods were required. High quality modern detectors are equipped with internal calibration features, which can perform low-level gas emission diagnostic tests on a regular basis to confirm the accuracy and operating status of the sensor. If the detector discovers any problem with the sensor, it emits a special sound pattern to alert the occupants the sensor is defective. In addition, each detector is fitted with a test button to allow the alarm circuit to be manually evaluated. Underwriters Laboratory (UL) has issued quality standards which have been adopted by the CO detector industry. As of October 1, 1995, a detector should bear the number "UL 2034" if it complies with current safety and quality standards. The future of carbon monoxide detectors is constantly evolving as improvements are made in gas sensing electronics. The IDR technology previously described is one example of this cutting edge technology. Future detectors will also incorporate similarly advanced features. Increased controllability offered by computer-controlled interfaces will make future devices more user friendly. These offer consumer benefit in the combined safety devices. For example, future generations of computer-controlled detectors may be linked with the household appliances, which are most likely to generate carbon monoxide, such as gas furnaces or hot water heaters. When the unit senses unacceptably high CO levels, it will send a signal to the appliance to terminate the combustion process and shut off the gas flow so no further carbon monoxide is released. As new models become available with improved sensitivity and other value-added features, CO detectors will be made even more userfriendly and will be even more useful as lifesaving devices. "Air Conditioning." Heating and Refrigeration News (March 6, 1995). US Patent #5132231 (Carbon Monoxide Detector). US Patent #5659125 (Automatic Calibration Method for Carbon Monoxide Monitors).